The house at 36 North Main Street was built in 1769 by Doctor John Manning, a pioneer in the use of the smallpox vaccine in America. After importing a sample in 1799 from England, he carried out a successful test on his family members and distributed the vaccine without payment to other practitioners, purposefully breaking the monopoly held by Professor Benjamin Waterhouse of Harvard. The citizens of Ipswich were understandably reluctant to receive Dr. Manning’s inoculations, having recently experienced the failure of his audacious commercial enterprise. In 1792 Dr. John Manning erected a factory at the corner of South Main and Market Street beside the Choate Bridge, and began the manufacture of coarse cloths and blankets in 1794. The completed building was two stories high, 105 feet long and 32 feet wide. On the roof squatted a great octagonal tower, inside of which were the arms and sails of a horizontal windmill by which it was proposed to operate the machinery. Why Dr. Manning chose to construct a windmill at the bottom of a hill beside a river is a mystery. The design was inefficient, and if it ever did operate, the rotating assembly would surely have been noisy. The business quickly proved unprofitable and was given up in 1800. The windmill and machinery were removed, and the building was converted to stores and offices by Ammi Smith. It was sold in 1847 to Stephen Coburn, who operated variety shop and the post office in the building. His home is now Kaede Bed and Breakfast on North Main Street. 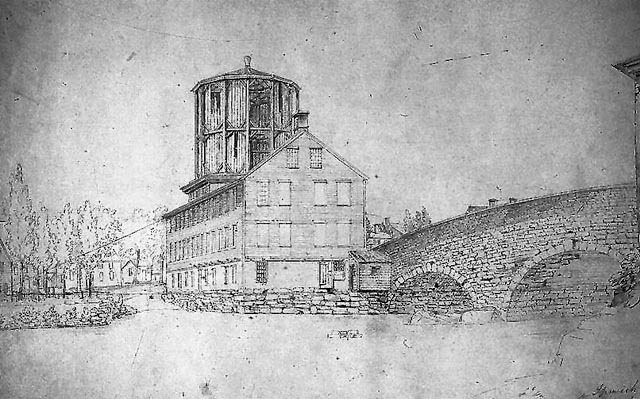 Sketches of the windmill were made by 12-year-old Mary Jane Derby of Salem. 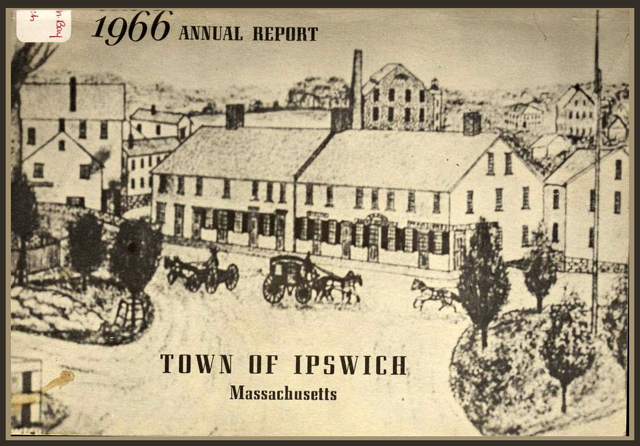 Half a century later she drew the illustration of the Coburn block (minus the windmill), which was reproduced on the cover of the 1966 Ipswich Annual Report. 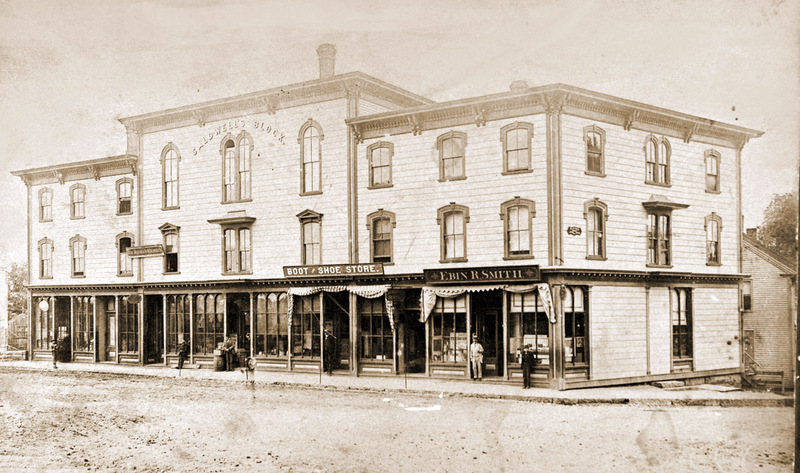 When the Coburn building was destroyed by fire in 1869, the lot was sold to Col. Luther Caldwell and his wife, Almira Flint Caldwell, who erected the present building in 1870. The Caldwell Block is the oldest large commercial building in Ipswich. 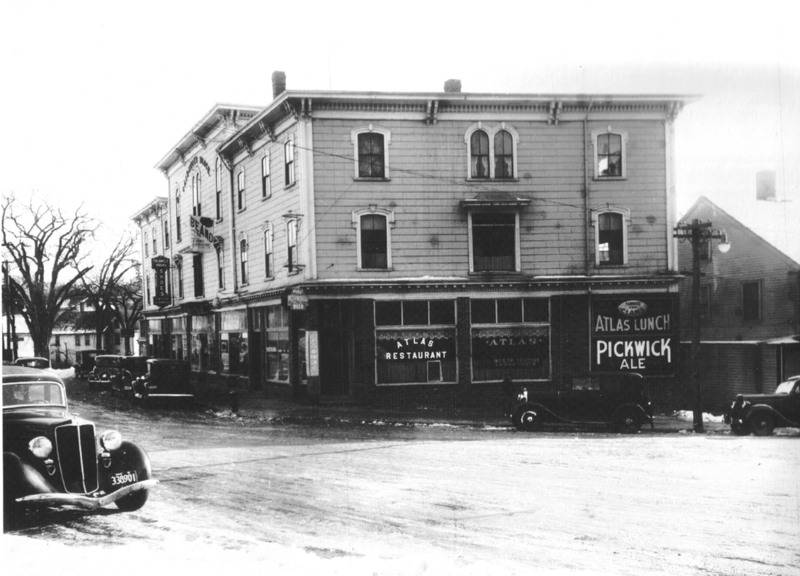 The photos below show that despite the change of establishments, the building remains easily identifiable. 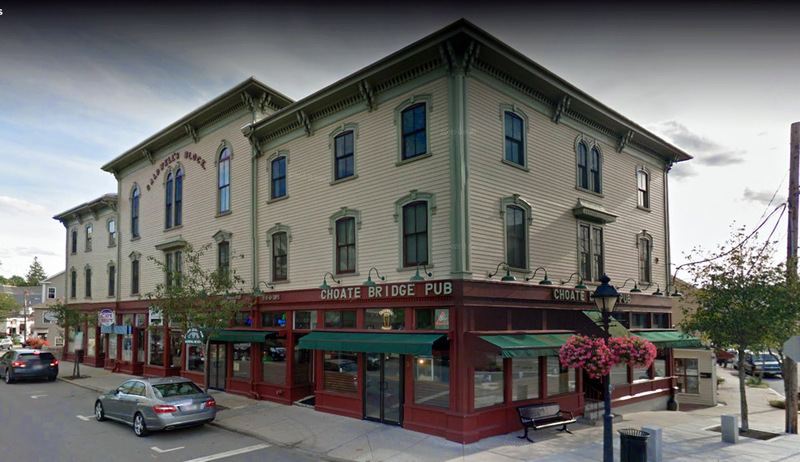 The Choate Bridge Pub anchors the corner now, but when John Updike had his office upstairs, it was the Dolphin Restaurant, and before that it was the Atlas Restaurant. Col. Luther Caldwell was born in Ipswich on September 17, 1822, died in 1903 and was buried in the High Street Cemetery. He was Clerk of the New York Assembly in 1867 and Mayor of Elmira, New York in 1873-74. He was an officer in the Civil War and a member of the convention that named Abraham Lincoln for President in 1860. He was secretary of the convention that named General Grant for President in 1868. He served as Chief of the Bond Division of the U.S. Post Office during the term of President Harrison, 1889-93. From 1961-74, John Updike, one of America’s foremost contemporary writers, occupied office space in the building. During this time he wrote almost all his major works in the building. The third floor was constructed with a large meeting hall and banquet room to accommodate the Grand Army of the Civil War, which was located here until the Memorial Building was built. The failed woolen mill in downtown Ipswich was not the last of the Manning family’s textile enterprises. 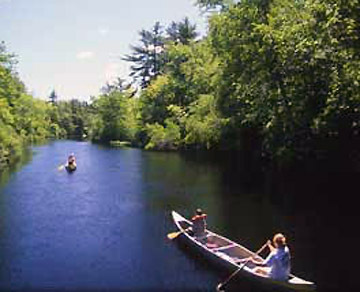 In 1834, at what is now the Foote Brothers dam, Dr. Thomas Manning constructed a mill that stretched both sides of the river. During the Civil War the dam made 55,000 pairs of stockings for the Union troops. The mill became a blanket factory, burned in 1881, and again in 1884 and never re-opened.